Pending AB 560 and SB 32 legislation top CALSEIA’s priorities. 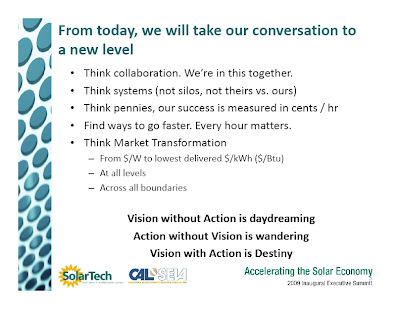 I discovered over a week ago the presentations from The 1st Annual SolarTech / CALSEIA Summit held in early May were online and had been for some time. When I inquired the day after the summit, I was informed it would take about a week to get them on the website. This derailed my post summit post intentions, and I moved onto pressing topics like Skyline Solar and power electronics. SolarTech and CALSEIA (California Solar Energy Industries Association) partnered on the collaborative SolarTech / CALSEIA Summit focused on six (6) SolarTech area Initiatives: Performance, Finance, Permitting, Installation, Interconnection, and Workforce. While the effort can have broader application, the Summit was oriented towards the California PV (Photovoltaic) market. 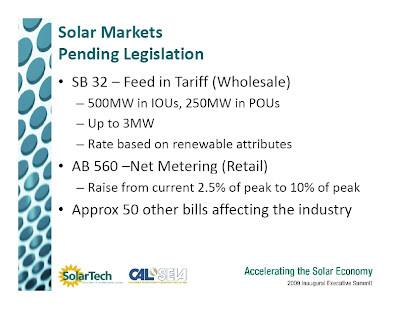 The above California Solar Markets Pending Legislation slide from Sue Kateley’s presentation caught my attention. AB 560 (Skinner), Net energy metering, is required to raise the current 2.5% of peak net metering cap to 10% of peak. California is close to hitting this artificial cap. Per Vote Solar’s action page, Don’t put the brakes on solar in California, AB 560 is up for a Senate Energy, Utilities, and Communications Committee vote on June 30, 2009. For further information, please see AB 560: Protect Solar Net Metering in California or this Sunday’s SFGate Editorial, “Legislature must act to keep solar glowing”. As the “SOLAR INCENTIVES Spinning the meter backward” background to the editorial notes, eighteen states do not have net metering limits. California cannot do a German style Feed-in Tariff. It’s just not possible. So anyone who thinks that this is going to be like Germany or Spain, no, we can’t do that. Because we have a different tax structure, we have a different utility system, and we have different needs in the United States and in California specifically. SB 32 would expand the existing Feed in Tariff program, Renewable electric generation facilities, to recognize the unique value of each renewable technology including photovoltaics and enables the California Public Utilities Commission (CPUC) to set Feed-in Tariff rates for wholesale generation up to 3 MW (MegaWatts) in size. In particular, I think AB 920 (Huffman) deserved a mention. This is the reincarnation of last year’s AB 1920: California bill goes beyond Net Metering requiring utilities to pay net metering customers for excess solar electric (and wind) power generation. The core of the Summit was organized around Breakout Sessions tackling each of the six SolarTech Initiatives. Doug Payne set the stage in his opening remarks. Committee Chairs outlined each Initiative’s Big Bold Opportunities, Panel of Experts, Challenges / Barriers, and Accomplishments To Date before the Breakout Sessions began. In the Finance Breakout Session, a moderated panel discussion dominated the time slot. Later, Summit attendees were able to comment, ask questions, or propose ideas. The Session concluded by drafting a list of the Top 3 Initiatives to address the Finance related issues identified earlier and during the panel. This process is captured for each Initiative Panel in the Summit Break-Out Sessions Tee-Off & Summit Reports presentation. I’ve include the Top 3 Initiatives text from each Initiative Panel below as a resource to facilitate web searches. Resulting in 25% reduction in transaction costs. Resulting in increase in available sources of capital while reducing cost of capital and search costs. Resulting in better understanding and access to new federal funds. I noticed First Solar, Inc. is not represented on any of this Symposium’s panel discussions.